So, the plumber takes the call and steps inside your house. "Hello" he says. "Hello, how wonderful that you have arrived" you reply. "Ah, well there's no time to waste" he points out. "Could you please show me the way to the shower room? Oh and I also need to check your study and bedroom if you don't mind. It's part of the routine, you see." "But of course! Step in please. And by the way, my bank statements are in the bottom drawer". Even if we wouldn't be so ridiculous when a plumber enters our house, we do exhibit this behavior when installing Android apps. 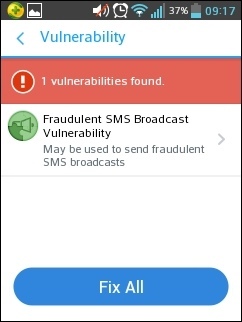 On the other hand, if you practice vigilance and reject apps that ask for suspicious types of access you would probably get to install mostly nothing. 360 Security is an antivirus software for Android devices. Although Android is not known to get infected by simply connecting to the internet, installing apps from sources outside of Google Play poses some security risks. Therefore 360 Security scans the installation files before they get installed and receive access to the system. This is at most what an antivirus for Android would do, because the only infection sources are dubious apps. But 360 is also a system optimizer. 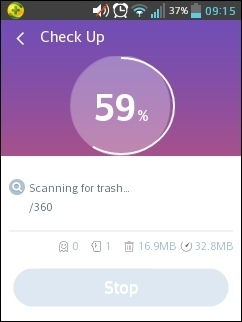 With one scan, it can detect the amount of memory that can be cleaned and trash data, along with any malware or system vulnerabilities. The memory can also be cleaned by using the sticky widget that appears on the edge of the screen. This works by dragging it downward (similar to MobileGo). Other functions include a quick scan, anti-theft tools, contact backup and a system for setting up a password for individual apps. For example, you can decide that opening the Notes app requires a password. In terms of visibility, the sticky widget can be removed if desired. However 360 Security will place a permanent bar in the notifications area. This contains some quick functions like memory cleaning or access to the recent apps screen. The power saver is actually pretty useful. As some Android apps have a way of not closing when dismissed, a function that keeps them in check is a very healthy thing. This especially if you use messenger apps that generally hang around reducing memory and draining the battery. 360 Security is regarded as being one of the best antivirus software packages for Android. Still that's not saying much considering that the mobile malware phenomenon is in its infancy (and probably will remain like this for quite a while). But it is nonetheless a very useful app for those of us who jump too quickly to install apps of all kinds without paying too much attention to their privilege requests.